After months away for new paint and some key modifications, including a conversion to long reach brakes, my ’95 Ritchey Road Logic is back and better than ever. 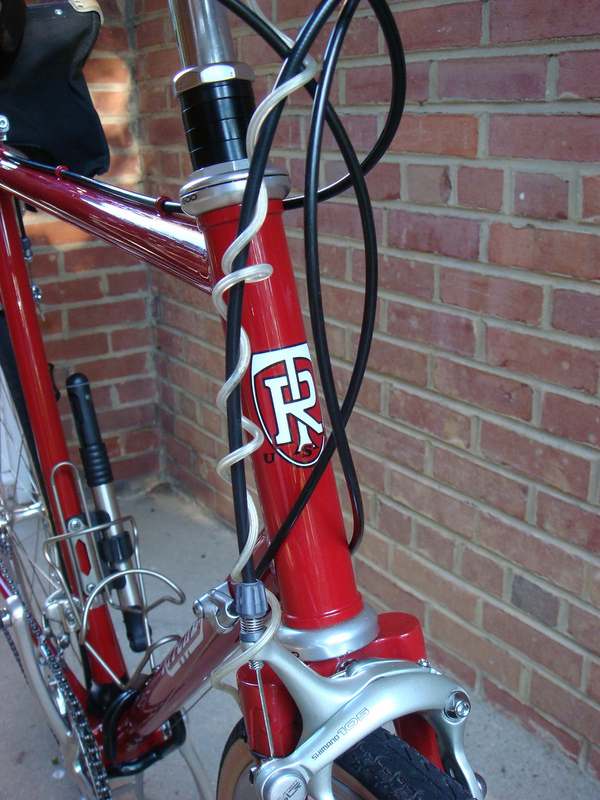 Paint and modifications were completed by Franklin Frame, a new fork came from Bilenky, and overall management of the project was ably performed by College Park Bicycles. Did you ever fuss over a bike because you were so proud of it and what you accomplished on it? 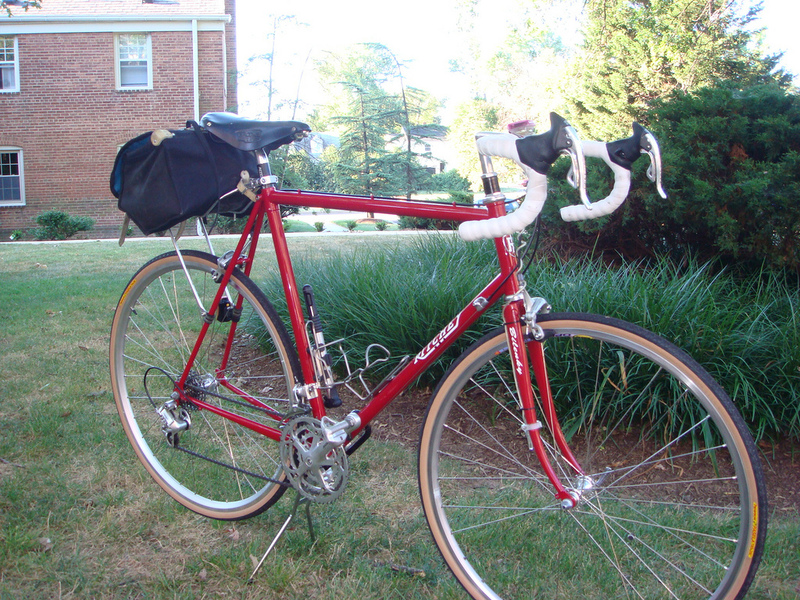 I pull out photos of PBP ’99 with me on my red 1995 Ritchey Road Logic and recall the amazement of all the firsts: my first brevet, my first series, my first 1200K, my first ride overseas, and my first PBP, all on that bike. Recently I had this bike refurbished and I’m really excited about it. In short, this bike went from a terrific steel race bike to a terrific race bike that can take 28mm tires and fenders and, of course, looks all new again. Here’s a picture of the final product. See a full set at my Flickr Page. This bike has seen a lot of changes. It would make a good video montage of prevailing road bike trends from the mid-90s to present. It was originally built up with Ultegra STI 8-speed levers and drivetrain with short-reach brakes. 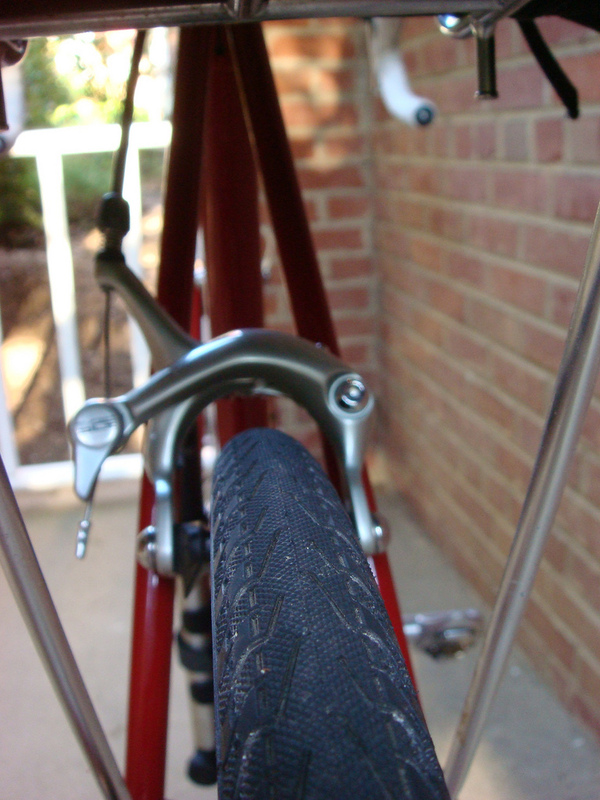 The saddle was a Turbomatic and I rode around on 23mm Michelin Supercomp HD tires. Somehow I didn’t mind the low bars and narrow high pressure tires, not to mention the road spray from fenderless tires. When the STI right lever locked up after a couple of years I switched to 8-speed Campy Chorus Ergolevers, Campy rear derailleur and a respaced 8-speed Shimano cogset. Later I switched to a Campy triple crankset, Brooks saddle and Technomic stem. Still, there was no way to get fenders under the unicrown fork and I relegated it to occasional use. I always thought that someday I would make the Ritchey into something more than a sunny day, skinny tire bike. Last year I got serious and measured it for 650b wheels and 63mm dual pivot brakes. I realized I would need a new wider fork, but the bottom bracket would still ride too low. My plan shifted to sticking with 700c wheels but converting the frameset to something close to a racy Rivendell Rambouillet. You know, 28mm tires and fenders, with handlebars level with the saddle. This project was totally worth it. The Ritchey is a great bike! It climbs with ease and the slightly long chainstays allow me to handle the bike with confidence when I’m tired. Tom Ritchey knows what he’s doing in terms of making a stable race bike. 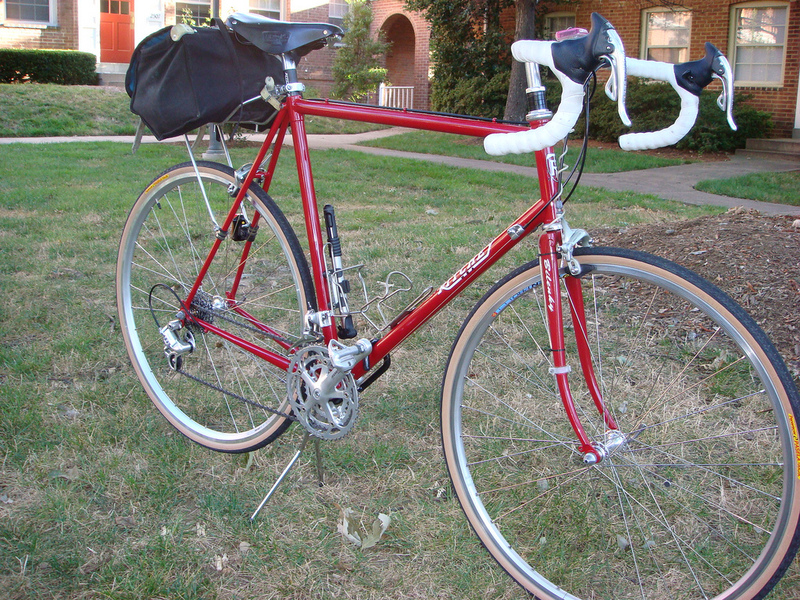 It was built by Ritchey’s longtime supplier Toyo of Osaka, Japan, which now makes Rivendell Bicycle’s production Atlantis, Saluki and Hilsen bicycles (and the on-hiatus Rambouillet and discontinued Romulus). Though welded and not lugged, a Toyo-produced Ritchey is still regarded as very high quality production frameset. The original Imron deep red had faded a little over the years, the stickers were peeling and it needed a repaint. That much had me somewhat ready to plunge in. But it was something as mundane as a rear wheel that was out of dish. I took it into College Park Bicycles and asked them to fix the wheel, and one thing led to another and soon I was discussing the big project with manager Charles P., who has become the go-to guy for randonneurs in the Washington area. We talked about the possibilities, and he gave me nothing but positive reinforcement. Soon enough the work was listed. Spread the rear stays to 132.5mm to take mountain hubs — CPB would handle that little job, no problem, along with tearing down and rebuilding the frameset. Charles then lined up Franklin Frame to repaint, add eyelets, add a chainpeg, and move the rear brake bridge to accomodate the new 57mm rear brake reach. But first he sent the fork to Bilenky Cycle Works to find out if Stephen & co. could build a new Pacenti flat-crown fork that allowed the 57mm brake while keeping the front-end geometry intact. 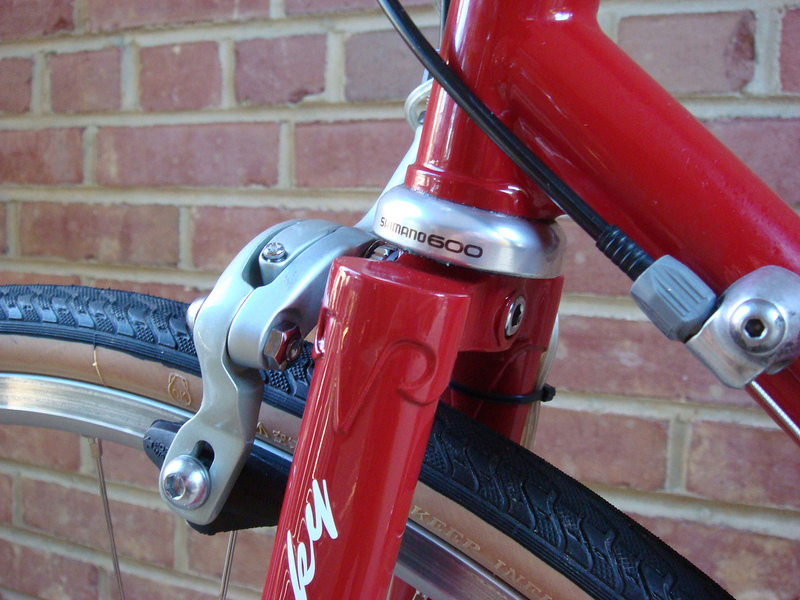 Bilenky said yes, they could craft a new fork that would keep the head angle within a half-degree or less. No surprise there; Bilenky can do just about anything. That was all we needed to get started. If anything the new fork raised the headtube a touch, though I can’t feel it, and slows the handling a touch, which is fine by me. Charles managed the coordination of the fork between Bilenky and Franklin and put it all back together when the frameset came back. Finally, a picture of the Bilenky fork. Franklin put on a Bilenky decal at my request to let folks know that Bilenky came to the rescue on this little project. Credit due, to my mind — the fork was the make-or-break part of this conversion. I’ll post an update when I get fenders installed. Bilenky made the front fork and it looks great.